Ducking into some bushes down from the track, I dropped low to answer the call of my churning insides. "Ah, that feels better," I thought after a few awkward minutes of hoping no one was watching. Continuing the short walk to the growing crowd, my mind picked up on the churning action. The first of two times I made this walk was in 1996. I was 39 years old. The last time was 1997. The race was a big deal to locals and many from afar. Back then, I was running strong. Not so much anymore. 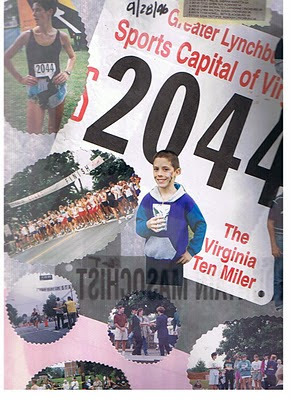 But, the Virginia Ten-Miler, now in its 37th running, pulled in nearly 3,000 runners this year to run the hilly course. So, what in the world was I doing toeing the line? I am not a road runner. I am an ultrarunner, much preferring the rocky ribbons of trail traversing mountainsides. But I am also a coach; a middle and high school cross country coach. Many of my kids had signed up for this race or the companion 4-Miler. And my assistant coach, Mr. Speedy Gonzales himself, was shooting for another sub-60, top ten finish. How could I not? I used to have plenty of fast twitch muscles. I was a champion sprinter in high school back in the mid-70s. Undefeated even. But miles of trails teamed with multiple birthdays have turned the fast-twitch into hardly a twitch. I have become turtle-like; slow and mostly steady. The road race scares me but. . . But it's those crazy kids; those kids who enthusiastically filled out the entry forms and sent them in. It's their willingness to submit themselves to the training. It's their glee to keep in front of me at practice. It's my competitive nature to not let that happen too often. Hence, toe the line I did. In 1996, just two years into my ultrarunning career, I ran 70:05, placing 7th overall for the woman. But after a 7:15 first mile this year, I couldn't fathom how I ever did that. Still, I ran on, trying to hold my pace up those big hills. I told myself to stay relaxed, try to enjoy the bands and people along the way. I watched as my top cross country girl began pulling away at mile three. I noted a friend of mine running just ahead of me waving to the crowd as people called to her. Everyone knew her. She looked like a princess going to the prom. I saw streams of runners ahead and behind. Occasionally, I heard my name but mostly ran in anonymity, alone in my thoughts though amidst so many in and along those city streets. Someone told me to have fun. Fun? Well, I'm not sure that labored breathing is a barrel of monkeys but - I tried. I tried to embrace this rare experience of racing on roads. I counted down the miles as I crossed the markers painted onto the road's surface. I worked hard to stay in contact with Prom Princess. I passed a number of people down a long hill. A few passed me as we ascended another. I wondered why the water station at the bottom of Farm Basket hill was handing out pink latex gloves to runners. I supposed it was some cancer awareness thing but was too tired to surmise further. That hill was sucking the life out of me and my mind finally relented to allow ten walking steps, twice, to keep my heart from exploding inside my chest. As I did, a young girl, about 18, I guessed, came along side and quipped, "Come on. You can do it. You are almost to the top of the hill." I wanted to smack her but that would have taken too much effort. I passed the final mile marker. I knew I would be close to 80 minutes, a time I arbitrarily picked as a goal. It was less than a minute per mile slower than I ran fourteen years ago. With 400 yards remaining, the still-smiling Speedy Gonzales ran out to bring me in after completing his race in 57 minutes. "Come on, Coach T. Here's a little down hill. You love downhills. You have a pretty good pace going. Now pick it up." Sadly, I could not. I couldn't even pick up a smile. I heard my name announced over the loud speaker. By my watch, I missed my mark by 20 seconds. Shoot. Had I used one less water stop. . .had I not taken those few steps. . .had I reached down deeper. I was glad to be finished but immediately felt disappointed by my failure. Still, I had faced my fear and found the finish. Awaiting the ceremony to see Speedy rewarded for his efforts, I heard the announcer say, "And the Women's overall Grand Masters champion is Rebekah Trittipoe." Yippee. I have to admit, I had thought about that possibility as I walked to the line and ran those ten stink'n miles. I didn't see anyone around me who looked old but they could have been out front. I could only hope. A heavy trophy was handed over to me, a photographer snapped my picture against the backdrop, and a certificate for a new pair of shoes was offered. Now I could smile broadly. Yesterday I ordered my free pair, a minimalist racing shoe. Then, I began looking for my next race. . .on roads. Scary. I must have been taken over by aliens. I really wasn't counting on the rocky route across the ridge. But there we were; three woman in their fifties ambling along. 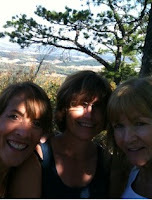 We were three-fifths of the girl contingent that converged in the mountains of Virginia. Joy, my sister-in-law, discovering she had an open week at her timeshare, had her sister, Jackie, fly in from California for the occasion. Joy's friend from childhood, Sue, flew up from Florida along with her sister, Jackie's best buddy from yesteryear. A full week of lounging, reminiscing, watching movies, cooking dinner, and other stuff one only does on vacation was planned. I was invited but could manage only a single-night sleepover and one day of fun. Still, it was better than nothing. But I digress. The three of us more adventurous types decided on a little hike. The trail descriptions were read over and over again, trying to decipher what we were getting into. We didn't want a paved path through the woods but Joy and flat-lander Sue didn't necessarily want ten miles of treacherous trekking. 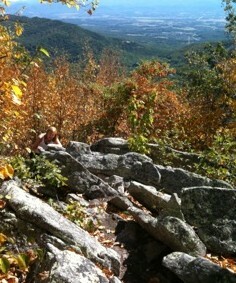 After some debate, we settled on the Ridge Trail, parking up the mountain where access to the trail was easy. The route would lead us along the spine of the mountains and take us to the top of a ski trail at the Massenutten resort. From there we would descend the mountain and hike our way back to the condo. We would reclaim the truck still at the top of the mountain later. I'm pretty sure Joy mentioned something about five miles in seventy-five minutes. Hum. "Ah, look at them. They have their little backpacks. Looks like they're prepared for a hike," I commented as we watched four grandma and grandpa types ascend the steep stairs leading to the trail. A few minutes later and just as we crested the stairs, here they came. They had enough. . .all three minutes of it. "Good luck if you are going to hike," they quipped. "Too many rocks." But we weren't worried. They could not deter us from our adventure. After all, we were much younger. Off we went. The trail wasn't smooth but was still runnable, I noted to myself. But we weren't there to run. We were happy hikers. After a few minutes of following the blue markings painted on rocks, we noted a blue diamond nailed to tree. "0.25 miles RT." One-quarter mile in the bag with a couple miles of Ridge Trail to go. Conversation flowed easily as we caught up on everything. No one struggled as my companions had daily walks and fitness to count on for conditioning. However, as the trail continued, our progress slowed as the rocks, pointy and standing up on edge, seemed to rise from the surface with increasing frequency. Still, we were content to feel the mountaintop breeze and take pictures along the way. We had read that the trail was "difficult, steep and rocky" about halfway in. "This must be what they were talking about," we surmised as we picked our way along the narrow and now much rockier trail. We had not seen additional mileage signs though numerous minutes had passed. "They must have decided not to put up anymore signs." We had to reconsider our assumptions. Sections further down the trail, if you want to call it that, took us on steep rock scrambles along the very narrow ridge. No dirt. No mud. Just rocks. Lots and lots of rock, boulders, even. The journey was so interesting we even decided to sit and contemplate life for a few moments every so often. It would have been nice to "contemplate" over a sip of water. . .but we didn't have any. Unfortunate. After what seemed like a very long time, we spotted one of those blue diamonds. "1.75 miles. RT"
"1.75 miles?!?!?" We were incredulous. How could that be? We figured we had traipsed at least three and a half rocky miles by then. But we had no recourse other than putting one foot in front of the other. We could see the ski slope off to the left along the same ridge and knew we were getting closer. Conquered, that is, until the rocks gave way to kinder, much gentler trail. It was easy going, nothing compared with what we had just done. We relaxed, our pace quickened. . .and then we all repeatedly tripped, stumbled, and faltered. What's with that? A life lesson, that's what. When you think about it, we are forced to concentrate on the here and now in a time of crisis or hardship. Instinctively, we focus our attention, keenly aware of our surroundings, circumstances, and necessary actions. We read our Bibles, pray, meditate, and solicit God's guidance in every waking minute. We are steadfast. We are strong. But as soon as the storm passes, we relax to the point where we lose mental and spiritual acuity. We simply proceed on in an automatic gear. Should we really be surprised when we stumble over the easiest obstacles, awakening only as we hit the ground? Be steadfast. Steadfast when the way is difficult. Even more steadfast when the path is smooth. Take nothing for granted. 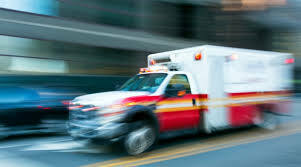 "To the line, Group 1. Ready? Go. Keep it steady. Hold that pace!" Group 1 took off on their appointed task, leaving Group 2 on deck and Group 3 in the hole. I held stop watches in both hands, trying to time laps and rest periods for the twenty-some teenagers making their way around the track. Lap after lap, they started, stopped, and sucked down gallons of water on command. Their faces told the story. After casual running throughout the summer, this practice was the first true test of so many things: fitness, speed, endurance, motivation, discipline, and of course, attitude. I tried to prepare them mentally for this difficult workout: a ladder run at tempo for 400, 800, 1200, 1600, 1600, 1200, 800, and 400 meter distances. The rest periods were slim at 1, 2, 3, or 4 minutes between the various rungs. It was tough; I proved that in the surreal fog of the early morning hours prior to practice when I ran the workout alone. I had told the kids I would never ask them to do what I was unwilling to do. Hence, my own fast paced laps. I was interested to see how they would respond. With the sun climbing higher in the sky and not a cloud to provide shade, the kids persisted. Each time they came to the line they brought with them determined faces despite fatigued muscles and labored breathing. No one complained. No one whined. By the time the last runner crossed the line, they were exhausted. Yet, I could tell they were pleased. It was a tough workout and they had divided, conquered, and returned with honor. I am proud to call them "my" team.